Charlie Ward was chosen in the 1st round (26th overall) of the 1994 NBA Draft by the New York Knicks. He began his career in the NBA as a point guard. During his NBA career, Ward established himself as a good three-point shooter, a reliable ball distributor, and a respected floor leader. Ward was selected to participate in the 1998 NBA All-Star three-point competition, finishing fourth in the event. He soon helped the Knicks reach the 1999 NBA Finals before falling to the San Antonio Spurs. 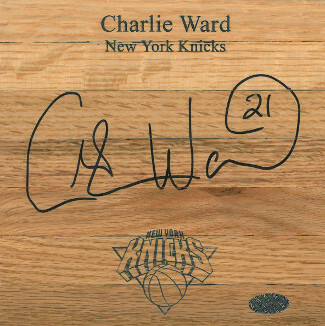 Charlie Ward has hand signed this 6x6 floor board. Leaf Authentics Hologram and Certificate of Authenticity from Athlon Sports.